I recall telling a fellow Canadian something a couple of years ago when they had wondered aloud why Americans were so adamant about their guns and why they were so up in arms over government health care. I explained to him that both issues stem from the same national sensibility and that America, as a nation was born of a distrust of government. The English crown was the problem back then, but the DNA today remains the same - at least for many Americans - government cannot be trusted. A light bulb went off for the Canadian in question. It did not change his opinion on health care I am sure, but it did clarify his understanding of why people would have certain opinions on certain issues. In fact, he was the type whom I'm sure could and would apply that reasoning to views on other political topics. Of course the explanation was a gross over-simplification of the conservative viewpoint on a number of issues. But the simplification had its benefits in that it crystalized quite quickly an understanding that had not existed before. Also, I got lucky. The conversation could have taken an entirely different, and more argumentative course if I had added one word to my explanation: healthy. If I had said America was born of a healthy distrust of government, I'm sure I would have made no progress in that discussion. The reason for the back story is that it relates to another issue. The original rationale for America is quickly disappearing. The idea that the United States was the child of a core human wish for freedom (not democracy, but rather liberty) has been subverted in two fundamental ways. Firstly, a democracy or a republic are different vehicles to achieve liberty - democracy has been substituted as the Holy Grail of the nation. That means for example more ballot measures are viewed as good. 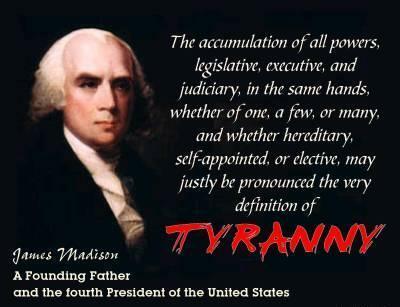 That also means that as this notion takes greater hold the United States, which is actually a representative republic and not a democracy, is likely to become more subject to what is known as majority tyranny (or tyranny of the majority) or mob rule. The notion that those who comprise the biggest and loudest voting blocks can have their way by simply overpowering smaller voting blocks. Because something is supported by a majority of voters does not mean that it is morally right. At various points in American history segregation and slavery were viewed as acceptable. In fact, it can be even worse - consider those who were burned as witches in Salem, or Jews from Nazi era Germany. If you are then a member of a minority then you risk having unfair disadvantages placed upon you by a self-serving majority. What's worse, is that if that majority is seeking to ostracize and punish the minority then what gets lost is liberty and justice for all. A great example of that is the Occupy Wall Street Crowd who have conveniently lumped the 99% of everyone in the country into their camp to fight against some fictionalized version of the top 1% of the country. The consequences of thinking like that are the hang the rich mentality or like what happened in France where the rich have been stuck with a marginal tax rate of 100% "temporarily". Why do you think Johnny Depp moved back to the United States? At least he didn't receive the same fate as Marie Antoinette. Critics of the concept of majority tyranny like Mancur Olsen (The Logic of Collective Action: Public Goods and the Theory of Groups ) have argued that narrow, focused and well organised minorities are much more likely to assert their interests over those of the majority who typically remain silent and are harder to organize. A lot of evidence supports that view - there are groups like the ACLU, and Code Pink that are vocal and get a lot of sympathetic press, and therefore public sympathy for their causes. Well, even if narrow interests have only a slight advantage, their advantage will tend to compound, much as an unbalanced pair of oarsmen will steer a canoe off course. Moreover, another important imbalance is at work: hard though it may be to organize interest groups, once established, they are even harder to get rid of. So it is no good to say that diffuse groups can and do overcome their challenges in particular cases; societies will still drift toward an accumulation of groups seeking and defending narrow interests — protective regulations, tax loopholes, subsidies, and so on. The element of time makes Olson’s analysis a theory of social development: other things being equal, societies’ arteries will tend to become clogged with groups in the business of obtaining for themselves whatever it is they want — subsidies to cotton growers, regulatory preferences for solar power, environmental protections for snail darters, you name it. And every group will see its own claims as vital to the national interest, and other groups’ as grubby handouts. In other words, what was once a minority has become so entrenched that it has effectively become a majority (at least notionally). American politician John C. Calhoun developed the theory of the concurrent majority to deal with the tyranny of the majority. It states that great decisions are not merely a matter of numerical majorities but require agreement or acceptance by the major interest in society, each of which had the power to block federal laws that it feared would seriously infringe on their rights. That is, it is illegitimate for a temporary coalition that had a majority to gang up on and hurt a significant minority. The doctrine is one of limitations on democracy to prevent the tyranny. The flip side to majority tyranny is minority groups becoming over time so powerful that they are effectively running as a majority. Getting back to my original point, under either scenario, minority tyranny or majority tyranny, clearly is a subversion of the true intent of liberty as in either case, impositions are made on groups of people that subvert their liberty - be it economically or socially. And if Olsen is right, then the tendency towards having all of society gravitating towards groups (a concept evidence indicates is indeed happening) dedicated to self-serving interests. Secondly, the rationale for America initially suggested that government was not to be trusted. There had to be limitations put on government to stop it from acting tyrannically (due to the majority or otherwise). But for too many Americans, perhaps because of their alignment with these various groups, that notion is gone. Instead they see the purveyors of iniquity and injustice as business. Particularly big business. Progressives have managed to subvert the distrust of Americans and direct it towards McDonald's and WalMart. If big is bad, the biggest player is the government. It dwarfs WalMart in the scope of it's power. What progressives have going for them are two factors. One is that it is pretty easy to make a visceral argument that business is driven by profit and therefore public safety, employee well-being and the good of the consumer are seen as secondary issues and in fact, merely hindrances to be overcome with as little effort as possible in order to continue to maximize profit for shareholders [NOTE: that's a subject I intend to look at next week]. Another persuasive notion is that business is bad when it is big. It seems that as industries mature, the concentration of power within that industry centralizes into an oligopoly or even a monopoly. The companies are then unfettered and able to focus on the bottom line and the shareholders to the detriment of the consumer and of the non-ownership class of workers. Where the solution of progressives to those problems falls apart is that they wish to strip those companies (and rich owners) of power (and money) and hand it over to the government - an even bigger power. Hence the objection of many to nationalized health care. But people still fall for that prescription because they understandably believe that government is not as self-serving as business. Government is by the people and for the people. But neither of those notions are true. Government is by self-serving elected officials who are often career politicians, and by bureaucratic agencies that are populated by people with their own jobs as self interest. That is not government by the people. And government for the people has devolved into government for the most vocal interests as Olsen had suggested. The lesson - scream the loudest, and progressives learned that lesson a long time ago. The rancor directed at the Tea Party is a reaction to the loss of a monopoly on screaming the loudest. Consumers and voters are no more guaranteed selfless service from government than they are from business (big or small). Or at least not much more. If business is driven by profit, government is driven in large part by taxable income which comes from business and ultimately is passed on to consumers. Government gets to set rules for business and consumers which makes them potentially far more dangerous than those they regulate. Sadly, people in need of protection from the unscrupulousness of others and misinformed about the very soul of their nation will take comfort in food stamps, and a notion of democracy where they can vote themselves more support at the expense of others. It's easy to do that, it's harder to accept that by doing so you are eroding liberty, empowering a self-serving government, and not really solving the problem of protecting consumers or employees from big business.